Every month, except November and December, the Hard Rock Hotel at Universal Orlando hosts a live concert called Velvet Sessions. It’s a 21 and over event that features classic rock and pop artists performing in an intimate club-like atmosphere. 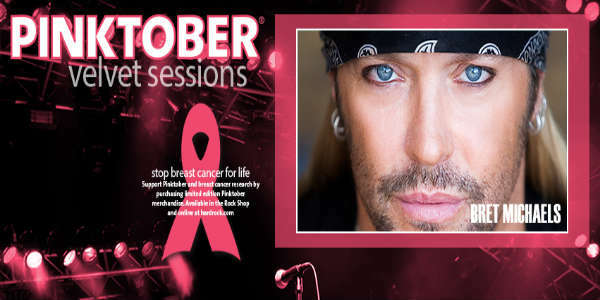 This month, Bret Michaels, lead vocalist of Poison, will be playing a special Pinktober version of the event benefiting breast cancer research on Thursday, September 24. This month, 80s hitmaker Bret Michaels will take the stage on September 26. Though recently known as a reality TV star, Michaels first rose to fame as the frontman for the hard rock band Poison. With that band, he sold over 30 million records worldwide, and had a string of hits, such as “Talk Dirty to Me,” “Unskinny Bop,” and the #1 hit, “Every Rose Has Its Thorn. This is a special Pinktober version, so tickets this month are $29 in advance online or $5 at the door. This not only gets you in the door, but free specialty drinks, finger foods and warm-up tunes from 6:30 pm until show time. Complimentary valet parking is also included. For $50, you can upgrade to VIP, which in addition to the above perks, gives you access to a special viewing area with a private bar, as well as all the benefits of the regular ticket. After the show, a DJ plays tunes until 1am. Must be 21 or older for entry. 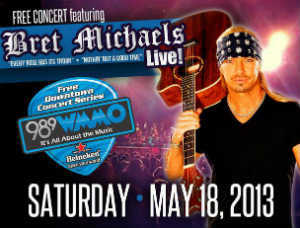 It’s time for the next WMMO Free Downtown Concert Series event for 2013, and this time it will be Bret Michaels of the band Poison taking the stage on May 18. The concert will take place in downtown Orlando at the corner of Orange Ave and Livingston, in front of the Orange County Courthouse. Gates open at 4pm, and the show starts around 8:30pm. There will be vendors selling food and drinks for this free concert that is usually packed with people. If you don’t want to stand all night, you can purchase VIP tickets that include seating by the stage and VIP bathroom access. Tickets are $45 (+$1 service fee) each. For more information, visit wmmo.com.